I found the web-based aggregator reporting information to be the most interesting as it shows the differentiation between reporting methods of top web-based feed aggregators (see diagram below). It brings to light the fact that not all products are reporting metrics in the same fashion which could affect the metrics FeedBurner is able to report. For example, Google reports item views on visible items while Bloglines reports all items on a page when it loads. If both Google and Bloglines load the Somewhat Frank feed, Google will report views only on items that are visible to a user via the scroll bar while Bloglines will report views on a page when it is loaded. Scrolling down to make two items visible in the Google Reader two views will be reported to FeedBurner while making two items visible in Bloglines will report still on all items on the page when it was loaded as viewed. 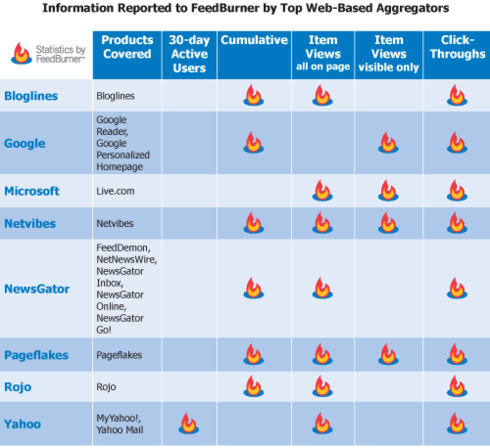 In the same respect, there also could still be products that are missing from FeedBurners metrics as Google did not report subscriber information until just last week and there could be other companies still excluded. For additional perspectives on FeedBurner's latest report check out articles on Olson's Observations, TechCrunch and /Message.